When I woke up this morning the windchill in Chicago was -20. Let that sink in for a moment. Then imagine me walking 15 minutes to work from the train station along the river. Yeah it's freaking cold here folks. My internal dialogue on my way to work is usually a scatter of things but when it's this cold all I can think about is how much I hate the cold and what I'm going to do to get warm when I get home. Here's where this soup comes in. 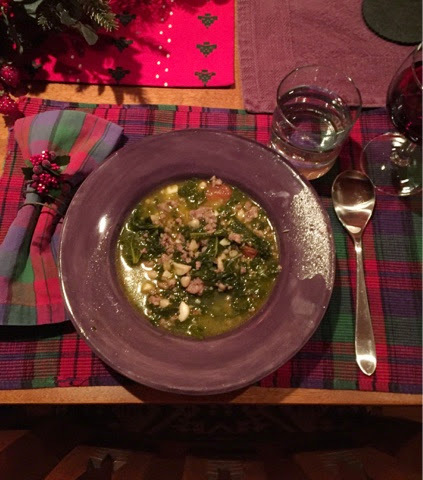 My aunt made this soup for us on Christmas Eve when we were in Colorado when we were feeling tired and cold from traveling. She simmered the soup for a few hours before serving and the mixture of spicy sausage and slightly bitter kale makes my insides warm just thinking of it. Enjoy! 1. Brown the sausage in a pan. Break up with a spoon as you go so that it they are bite size pieces. Add the red pepper flakes and garlic until you can start to smell the garlic. Stir in the kale pieces until wilted (just a few minutes). Add the beans and stir together. Let cook for 1-3 minutes. 2. Add the stock and bring to a boil. Stir in the butter, tomatoes, and half of the parsley. Put the heat on low. Here is where you can choose your own adventure. I would recommend that you let it simmer for at least a half an hour, but it tastes better the longer you simmer it. If you have the time, make everything in the morning and let it sit in the Crockpot on warm for the day. 3. Before serving, stir in the majority of the cheese and add salt and pepper to taste. Once you have it in bowls, sprinkle a little bit of Parmesan and parsley on each and serve. Recipe adapted The Gourmet Cookbook.